Are you looking for a free live support software to chat with visitors on your website and track their footprints? 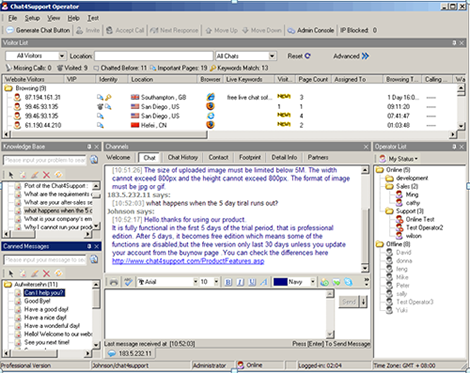 Chat4Support can be your best free live chat software and visitor tracking solutions, which can help you easily and instantly live chat with website visitors, monitor site traffic, and analyze visitors' web activities, including their search engine and keyword usage. As an online business webmaster, you may have such questions: "How to chat live with my web visitors proactively? ", "How to add a free live chat to my website? "No matter you are a webmaster, online store owner, e-business manager, customer support person, or online sales representative, you would like to add live customer chat widget for your website and talk with your visitors real-time. A cost-effective or free chat help solution will be very useful for you to have a free online website chatting with web site visitors. Our product – Chat4Support gives your visitors the opportunity to chat with you in real time just by clicking a chat button from your site. It will be your best free online chat and customer support solution, which can help you to interact with your web site visitors, and helps you improve your sales and customer service. In addition to the live support chat features, Chat4support can support tickets from visitors, customize chat button, review chat histories, and even use skype phone to call visitors. You may provide website live chat support to your live visitors, or offer them with a support ticket system when the operator is off-line. 6.Paste the chat button HTML codes into your web pages where you wish to have a chat button appear. After installing this live chat program, you can instantly get your own live customers chat to your website and live chat with your customers online. Do not hesitate to download this free live software and have a free trial experience. From now on, you will improve your sales and stay in better touch with website customers or visitors.